My nails were always really brittle and always peel, that's not good if as soon as your nails are lovely and long they break, which is what always happen to me. I have this weird thing with my nails that the first layer always peels off, does anyone else get that? So I decided to pick up this top coat that claims to strengthen your nails. 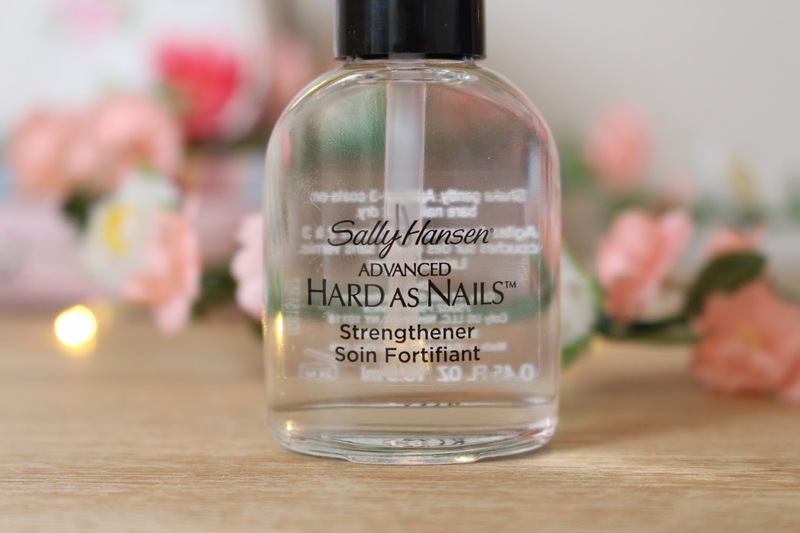 It's the Sally Hansen Hard as Nails Strengthener. I picked it up from Boots for just £4.75, which I think is a great price even if it's just for a top coat. I apply this just as a normal top coat over any coloured nail polish, and wait for it to dry. Overall it is a great top coat and has a really nice finish and shine to your nails. It helped my nail polish last a lot longer, I noticed without chipping. After 2 days there already seemed to be a difference in my nails and I do have to say they did seem to be getting stronger and they were no longer peeling as much. After I had removed it using my normal nail polish remover a week later, I can honestly say my nails looked and felt a lot healthier. They don't bend or chip as easily which is a great benefit as they almost always used to bend and break. I also don't seem to get the weird peeling thing anymore either, which also is amazing! If your considering buying this and thinking does it really work? then I suggest you pick it up and see if it works for you. Even if you don't notice a change in your nails like I did, it does make a great top anyway. I think this is an overall great product that really helped my nails. I hope you enjoyed this post and thank you for reading. I will be buying this in my next haul! I am always chipping my nail varnish and this sounds like it will really protect them! I also feel my nails look horrible after talk off polish so yeah it's going on my list thanks to this <3 i really love your blog and it would mean a lot if you could check out our blog and leave a comment mate! We struggle with getting all the views an comments we would like :( thanks! I may give this a try!